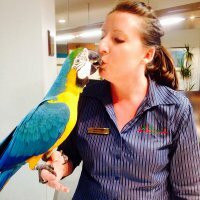 Kelly commenced with Animal Emergency Service in 2011 after a career working in customer service and working with the gorgeous koalas at Currumbin Wildlife Sanctuary. After many years working with AES, Kelly is excited to have commenced her studies in Veterinary Science at the University of Queensland. In her spare time, Kelly enjoys to “sing, eat and play.” She has a DSH named “Spider” who has the most amout of attitude she’s ever encountered in an animal. There’s also “Spooky” a British Short Hair X who loves nothing more than dangling her legs over the shower railing and surveying the area.